You’re going to be craving Korean BBQ once you see how many great BBQ restaurants there are around Seoul. Trouble is, which is the best? With everyone asking the same question, we sought an insider opinion about the 10 best places to eat Korean BBQ in Seoul, called galbi in Korea. Famous for: Galbi jjim (갈비찜) Beef short rib steamed with carrots and potatoes and a whole lotta gravy. Famous for: Being foreigner friendly (no more trying to pronounce dishes in Korean), it’s also a decent and clean atmosphere. Great for group gatherings and the like. Famous for: The ultimate after-hour place. The place to see and be seen in the posh cheongdamdong area. Open 24 hrs, it’s pretty famous amongst the locals, too! 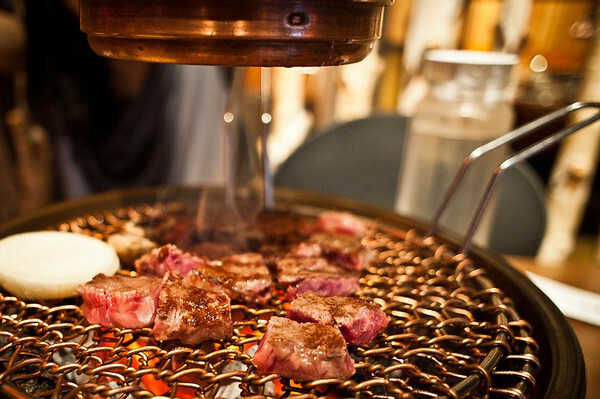 Famous for: Daeji galbi (pork BBQ). Great quality, affordable pork. Samgyupsal fans unite! Famous for: Being upscale, serving the highest quality charbroiled beef money can buy. Famous for: Its top-quality service, which matches the standards of the grilled beef served. Excellent spot for accommodating big groups, but we hope everyone’s a big spender. Famous for: Craft cocktails, galbi meats with a few options for Texas-style BBQ too and of course, the southern hospitality that comes with it. Famous for: Being a fusion of Korean and American-style BBQ on the other side of the world. Think Korean grilled meats with American dips. Meats are smoked over cured Korean oak wood, but in a customised offset smoker built in Texas. Which flavour sounds the most delicious? Famous for: The pork belly with 8 flavours; ginseng, wine, pine leaves, garlic, herb, cirry, miso paste and red pepper. Palsaik means ” 8 colours”, and Samgyupsal translates to “pork”. Tip: Bring your own side dishes to buff up your meal. It’s allowed! Famous for: Quality BBQ with affordable prices, set in an old-school hole in the wall-style eatery. Seoseo means “standing”, so you’ll want to gobble up as much meat as you can, and be on your way right after. Feel that? That’s your knees weakening at the thought of this meal. Famous for: Having a zero-frills menu consisting of beautifully marbled and tender sirloin beef, kimchi fried rice and porridge. Guests sit on the floor and dine in traditional Korean style. Even if you’re not into beef innards, there’s a big variety of cuts you can order. Famous for: Gop chang (beef intestines) and tripe. A server will cook your choice of meat in front of you if there are a minimum of two people at your table. Did we leave anything out? Which is the best Korean BBQ you’ve tasted, nomads? Photo credits: Main, 1, 2, 3, 4, 5, 6, 7, 8, 9, 10, 11, and 12. I’ve tried Maple Tree and Saebyukjib along with some others on various visits. I must say, Saebyukjib is my absolute favourite. I’ve got another trip lined up so may try out one of the others you have mentioned. Thanks! Glad to hear it Lily! Let us know if you have any new finds we can add to the list!